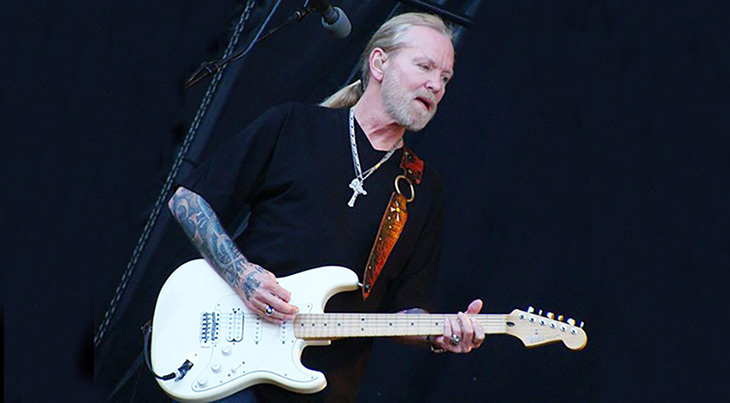 Blues and rock singer/songwriter Gregg Allman's biggest hit song "I'm No Angel" (1987) could have been the title of his 2012 autobiography (instead titled My Cross to Bear). Born December 8th, 1947 in Nashville, Tennessee, Gregg Allman and his older brother Duane shared a mutual love of R&B music and playing guitar. The brothers formed several bands during their teen years in the 1960's, and had some early success singing cover tunes as the Allman Joys in the mid-60's. In addition to guitar, Gregg played keyboards and was encouraged by Duane Allman to sing. Gradually Gregg began testing his songwriting skills. 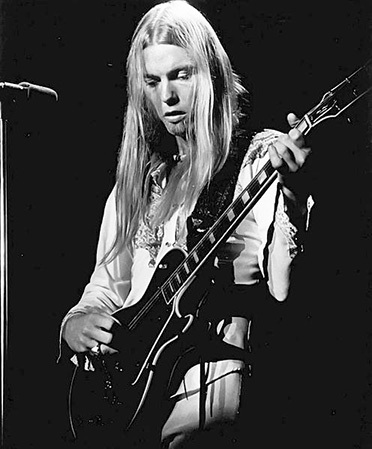 In 1969 Duane and Gregg Allman formed The Allman Brothers Band, and they started to gain fame during the 1970s. An unfortunate by-product of their success was access to more funds, which fueled drug and alcohol addictions for most of the band, including both Gregg and Duane. Tragically, Gregg's big brother Duane Allman died in a motorcycle accident (October 29, 1971) at the young age of 24, followed a year later by the death of fellow Allman Brothers bandmember Berry Oakley, in another motorcycle accident. Before breaking up in the mid-1970's, The Allman Brothers Band had a Top Ten hit single with the iconic Southern classic, Ramblin' Man. Included on the Allman Brothers 1973 album Brothers and Sisters, Ramblin' Man was written by bandmember and legendary rock guitarist Dickey Betts. Growing as a singer and songwriter, Greg Allman had already ventured into solo recording and performances. Some of his songwriting hits for himself and other artists include Whipping Post and Midnight Rider (1973), arguably his best and most iconic song. Midnight Rider became a Top 20 hit for Gregg Allman. Below, Gregg Allman sings Midnight Rider with The Allman Brothers Band. After a short-lived Allman Brothers Band reunion in the late 70's and early 80's, Gregg Allman again went solo. Unfortunately his substance abuse problems consumed much of the next several years of his life. 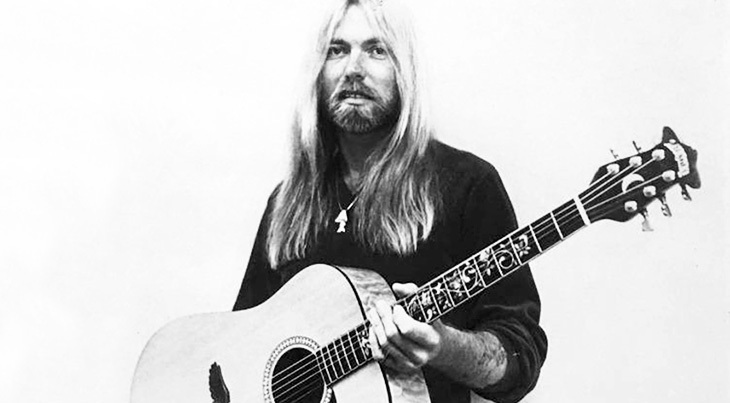 In 1987, Gregg Allman resurfaced on the music charts with his hit album and single of the same name, I'm No Angel. Also from the I'm No Angel album and making it to #3 on the U.S. Rock charts was the single Anything Goes (1987). The following year, he had a modest hit with the song Can't Get Over You (1988), and his single I'll Be Holding On was included in the Black Rain (1989) movie soundtrack. In the late 1980s Gregg Allman went through a cocaine overdose, got married for the 5th time (to Danielle Galliano), had a foray into acting, and once again reunited for a short time with The Allman Brothers Band. In addition to struggling with drug and alcohol abuse for much of his life, Gregg Allman survived a number of life-threatening illnesses that beset him in his 60+ years. In 2007 he contracted hepatitis C; according to Allman, caused by a dirty tattoo needle. Liver tumours were discovered in 2008, followed by a liver transplant in 2010. He was sidelined again with an upper respiratory condition that curtailed a 2011 European tour, and subsequently underwent lung surgery. He then required a stint in rehab for addictions triggered by his treatments. "I won’t do anything for more than five hours anymore because I get tired and don’t trust my brain, but in that time my band can learn eight songs....I was inspired to see that man (Sam Moore, of Sam and Dave) singing like that at age . I’ve often worried about my chops disappearing when I turn 70 or something but that man sings just as good as he ever did. That was really encouraging. " Below, an older and emotional Gregg Allman also talked to Dan Rather in 2015 about his life, stage fright, and struggles with alcohol and addiction. After his 1995 induction into the Rock & Roll Hall of Fame and 13 previous unsuccessful rehab attempts. Allman was able to kick his addictions to heroin, cocaine, alcohol, and cigarettes. "No Angel", now redeemed. In his senior years, atrial fibrillation required Gregg Allman to keep a light touring schedule; when his liver cancer returned he kept it on the down-low. Gregg Allman died of liver cancer complications on May 27, 2017 at the age of 69. He left behind his 7th wife of only a few months, Shannon Williams (married February 2017), and grandchildren courtesy of his own 5 children. From Allman's previous 6 marriages and divorces (including a brief marriage to Cher in the 70's that produced son Elijah Blue Allman), he had 5 children. His 4 sons Michael Allman, Devon Allman, Elijah Blue Allman and Layla Allman, all work in the music industry, while daughter Delialah Allman is a nurse. Gregg Allman's last album Southern Blood contained the poignant single My Only True Friend, which could have served as his epitaph. Below, Gregg Allman performs My Only True Friend. Note: This article was first published in 2015 under the title Happy 58th Birthday Gregg Allman. It has been updated with new & additional content.